This is how I felt about this challenge too. In order to promote her new line of baby clothes at Babies R Us, Heidi forced the designers to make looks for babies to fit her line. She announced that there would be two winners--one boy look and one girl look--which would both be produced and sold with her line. The challenge had two twists. One twist made sense--they had to create a companion look for the moms. The other twist was ridiculous. The designers were give those fake, creepy robot babies they make high school students take care of. Seriously? Sure, it was really funny. Yes, Dmitry had a thousand hilarious quotes. It was good television, but it was annoying in light of the ultimate goal--fashion! Anyway, the designers didn't do a terrible job. Most of them really did the best they could with having to take screaming robot babies home at night. (They were even given cribs for this. Seriously? Dmitry just stuck his in the bed next to him. Unlike Fabio, he was very aware that this was not a real baby.) 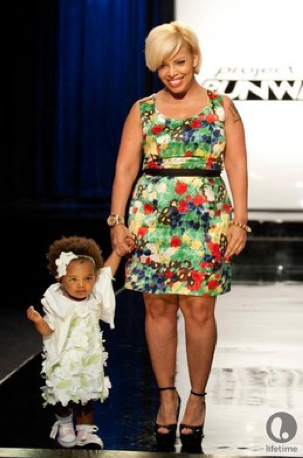 Also, the mom's looks were hardly discussed on the runway and really had no bearing on the outcome. I have no idea why they even had to make them. I'm going to try to recap this as seriously as possible because that's how the judges judged it, but I don't get why this is a good idea for a Project Runway challenge. Dmitry created a cute little red outfit for his baby boy. The hood unzipped into a cape. Michael Kors worried that this was too costume-like. Heidi, Nina and Guest Judge Hillary Duff all jumped in to assure him that babies love to have whimsical clothing like that. (My nephew would love it if his clothes had hoods that turned into capes! He's two.) I thought this was a great look, but the judges weren't too sure. The mom look was wonderful. She could actually move around quite well and looked effortless. Fabio also had to make a look for a boy. His mom loved dressing herself and her baby in vintage clothing so Fabio went for an old fashioned look. It came together super cute. I love the little monster print pocket on the back. I didn't love the dress for the mom. Heidi thought it looked "mumsy," but Nina liked it. Sonjia took the winning spot for boys looks. She created a little suit out of sweatshirt material so he was dressed up but comfy and able to move around or take a nap. Also, it looked easy for his mom to wash. She used Heidi's monster print for the tee, but the look could easily be dress up or down. Since it won, it will actually be in production with Heidi's line. The mom look was also super comfy and easy to wear while still looking chic and put together. Sonjia should make more clothes that nicely. Christopher had the most difficult clients. 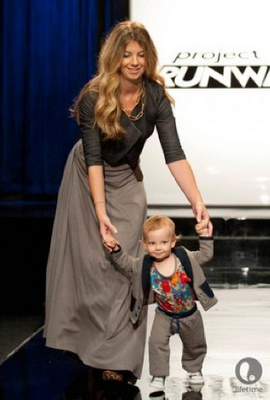 His baby was probably one of the best models and she was totally adorable, but her mother was so picky. In fact, she tried to dictate everything Christopher did. (Her baby always wears 3/4 sleeves! Really?) She hated the look for her daughter and herself. The judges, however, didn't care what the moms thought. They just cared about the looks, which they loved. They liked that both mom and baby were clearly going to a special event. They liked that the baby had a flower dress on while the mom had a floral look. They also loved the sweet little denim jacket. Christopher's look will also go into production. Melissa struggled the whole challenge. Her mom look was a total disaster. The baby was in a shift dress, which babies don't wear. It kept riding up over the diaper. It was very hard to get on the baby (who did not make a huge fuss about being twisted into an outfit--surprising). I was sure she was going home, and I'm still confused as to why she didn't. I like Melissa and all, but this was clearly the worst look. Elena was eliminated, and I don't know why. Her mom look was nice and I thought her baby look was cute and playful. The judges didn't like that it was disjointed with the three piece and three colors. Have they seen baby clothes? They tend to be pretty gaudy. The jacket she made was great with the little ruffles all around it. I'm really confused. Does anyone know why she went home? What did you think of this challenge? Did the right people win? Did the right person go home? Next week is the final challenge. I will be late with my recap because I will be in Japan! But don't worry, I'll have a recap up before the home visits start. Who are your picks for top three? I'm going to say Chirstopher and Dmitry with either Sonjia or Fabio. I don't really care who the third is as long as Christopher and Dmitry make it. I have no idea why they sent Elena home...Melissa clearly had the worst look. Took me totally by surprise! Elena's outfit was adorable...love that little jacket! Hopefully they will keep Christopher and Dmitry through to the end. Love Dmitry's designs! And the robot babies...ridiculous! I actually really liked the challenge just because it was unique. And it shows that the fashion/clothing industry isn't just about adult women. I think the right people won. I'm ok with Elena going. I think the judges take past looks and personalities into account more than thy let on. I did think it was weird that the judges actually praised Melissa's mom look even though it was obviously terrible.